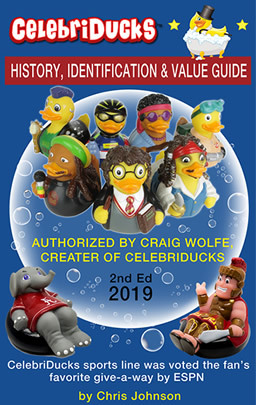 CelebriDucks History, Identification & Value Guide 2019 (2nd Edition). 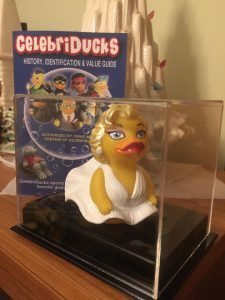 Donna was sent a signed, prototype from the private pond of Craig Wolfe, the creator of CelebriDucks. My name is Donna Eads, owner of Scout’s Meadow Natural Soaps, LLC , and I am a hand-crafted soap maker from Forest Hill, Maryland. After 31 years of employment with our local government, I retired on my 50th birthday and started my little company – Scout’s Meadow Natural Soaps. I love making soap and my customers seem to love it too! In addition to my soap, I also like to carry unique items for the bath and that’s where CelebriDucks entered my life. While on a family vacation in Disney, we visited The Boathouse in Disney Springs. I walked in and bumped right into the most beautiful display of ducks I had ever seen. As I looked thru them, each one was better than the one before it. But I didn’t buy any at that time because my suitcases were packed to the max. 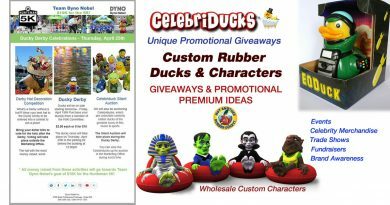 Funny thing – I came home from a Disney vacation and cruise, and the first thing I think is “I gotta see where I can get those ducks.” After looking at the website, I called to inquire about a wholesale order and left a message. 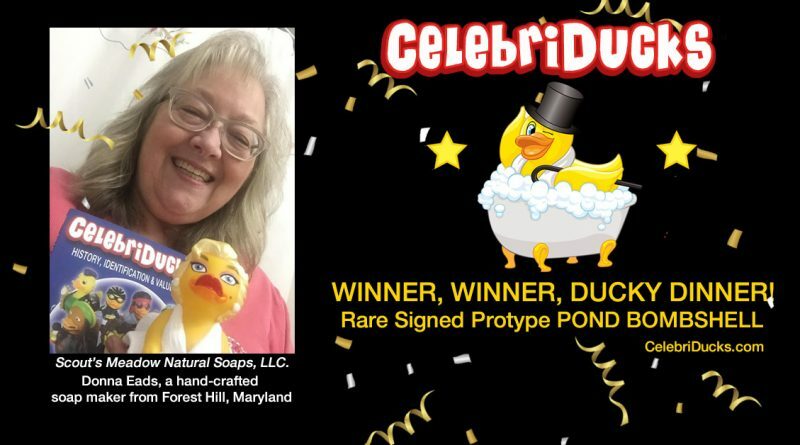 Who calls me back – none other than Craig Wolfe, the owner of CelebriDucks! I have restocked with 3 wholesale orders so far, and must say this company is great! Craig is so nice, so easy to work with, and so passionate about his ducks! I am so happy to carry them and not only are they a great complement to my soap, they are actually an eye-catcher at my vendor events! Customers love these ducks! And to top this all off, I have won the prototype of The Pond Bombshell signed by Mr. Wolfe. This was all possible just for giving a review of the Celebriducks History and Price Guide book. If you sell or collect these ducks, the guide is a must have! See my review here.